Associated with improved urinary flow. Seems to improve symptoms of benign prostatic hyperplasia. The berries of Saw Palmetto (Serenoa repens) are traditionally used by Native Americans to clear the urinary tract and to treat genital problems. 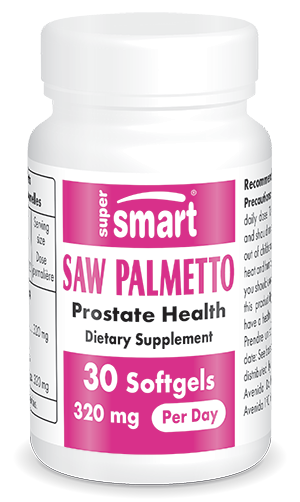 More than twenty double-blind, placebo-controlled studies have shown saw palmetto extract to be effective in relieving symptoms of benign prostatic hyperplasia. It works in a number of ways. It appears to affect the conversion of testosterone into Dihydrotestosterone (DHT), by inhibiting 5-alpha reductase. It prevents DHT from binding to androgen receptors in prostate cells. Saw palmetto also reduces smooth muscle contractions, thus relaxing the muscles of the bladder and the sphincter which cause the feeling of urgently needing to urinate. Saw palmetto extract can help shrink an enlarged prostate, thus improving urinary flow. In one study, 505 men received 160 mg saw palmetto extract, twice a day. After 45 days' treatment, they reported an improvement in urinary flow, a reduction in residual urine volume and in prostate size, as well as an improvement in their quality of life. After 90 days, 88% of patients and their doctors considered the treatment to be effective. For men over 40, Saw palmetto extract is the first line of defence against benign prostate adenoma: it's the best prevention a man can choose for long-term protection of this essential organ. To maintain a healthy prostate, this Serenoa repens extract can be combined with other natural active principles such as lycopene, a powerful antioxidant found in tomatoes. In addition, Prostaphil™ is a specific pollen extract for the natural treatment of prostate problems. For optimal efficacy, choose ProstaNatural Formula which contains no less than 10 natural active ingredients including extracts of pollen and saw palmetto.